Beijing reports that he is terminally ill, His Holiness the Dalai Lama left on a 10-day lecture tour of the Baltic states Tuesday. On Monday, an ‘exclusive’ report by a website citing unnamed Indian intelligence sources claimed that the Tibetan leader “is suffering from prostate cancer and has been undergoing treatment in the US for the last two years. The Dalai Lama’s health has been a cause of constant concern for his followers and well-wishers worldwide, particularly since China has announced that it would replace him with a “Chinese reincarnate” after his demise. As for insinuations that the Dalai Lama needed support while walking because of cancer, he said that the Dalai Lama did have mild osteo-arthritis, common to people his age, but that did not prevent him from maintaining “a gruelling pace” which many youngsters would find hard to match. In fact, the condition was so mild that it did not even require surgery, he said. 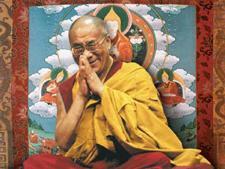 “His Holiness the Dalai Lama is in excellent health. 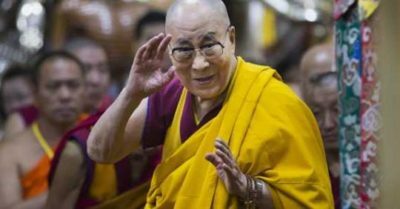 He himself has repeatedly told the Tibetans that he is in excellent health despite his age and not to worry,” concurred Sonam Dagpo, Secretary, International Relations, and spokesperson for the Central Tibetan Administration in Dharamshala. Chime Rigzin, a secretary to His Holiness, expressed surprise over the report, and said that it was disturbing that the writer had not called the Dalai Lama’s office to confirm. A look at the Dalai Lama’s public schedule shows a hectic schedule right up to February 2019. After his return from Vilnius, Lithuania, and Riga, Latvia (June 13-18) where he delivers back to back talks and lectures, His Holiness returns to Dharamshala and conduct four days of teachings September 4-7 at the request of a group from Asia including Indonesia, Korea, Malaysia, Singapore, Thailand and Vietnam at the Main Tibetan Temple. He will then travel to Rotterdam, The Netherlands, September 16 -17, for talks and lectures, and then attend a conference on non-violence in Darmstadt, Germany, before participating in a religious ceremony celebrating the 50th anniversary of the Tibet Institute in Rikon and Winterthur, Switzerland. In October, he will continue teaching and lectures in Dharamshala, and attend an event in Manali Himachal Pradesh. “Does this look like the schedule of a ‘terminally ill’ person?” asked an official from the Dalai Lama’s office, wondering whether there was some ‘ulterior motive’ behind the article which said he was terminally ill.